Units in the Halcyon multi-zone line offer units with ratings up to a Seasonal Energy Efficiency Ratio of 18, and a heating seasonal performance factor of 9.5. Outdoor units are available in 18,000; 24,000; and 48,000 Btus. 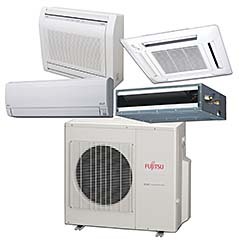 Wall- and floor-mounted, slim duct and compact cassette indoor units are available in 7,000, 9,000, 12,000, 15,000, 18,000, and 24,000 Btus. The mix-and-match of evaporator types and capacities allows for greater flexibility during specification.